PORT CARLING - Thousands of Ontario's loons are succumbing to horrific deaths. "The toxin starts paralyzing the muscles, so they can't swim and they drown," explained wildlife biologist and bird expert Tyler Hoar. According to Hoar, botulism is killing off one of Ontario's feathered icons. "Once it gets into them, it's difficult to get out," he said. "If you see a loon that can't keep its head up, it's usually too late." Hoar was a guest speaker at a fundraiser luncheon hosted by Muskoka bird rehabilitation centre A Wing and A Prayer at the Port Carling Community Centre on May 25, giving a presentation on the plight of the loon. Hoar said there are somewhere between 65,000 and 97,000 loon breeding pairs left in Ontario. "That may sound like a lot, but we're losing 10,000 a year on the Great Lakes alone because of botulism," he said. Hoar said many species of waterfowl are affected by the disease. "Ducks are dying off too but we think they can withstand," he said. Weighing in at four times the size of a common seagull, the great black back gull isn't so lucky. "He's the top dog of the system, but they're basically dying out as a breeding species in the Great Lakes," Hoar explained. "They've become scavengers, so they're eating the dead birds and getting botulism. According to Hoar, botulism is naturally occurring in the Great Lakes but increases to a harmful level because of invasive species including zebra mussels and round gobies, a species of bottom-dwelling fish. He said both species made their way into the lake system in the bilges of ships. "Wherever they are botulism fires up and it's going to be an annual event as long as they exist here," he explained. Hoar said the problem originates with algae caused by nutrient loading. The algae fall to the bottom of the lake and rot. Fish then eat the rotting matter infecting themselves with the bacteria and spreading it to other species that eat them. Alternatively, some fish contract the bacteria by eating zebra mussels. "When the gobies get (botulism) they start swimming erratically and look like the perfect fishing lure, which attracts birds to eat them," he explained. Humans are also at risk of contracting the illness through undercooked fish. Hoar said you should never smoke fish caught in the Great Lakes because the process doesn't kill the bacteria. He noted an incident in Michigan where multiple people died after eating smoked fish. In 2011, more than 6,000 birds were found dead along the shore of Georgian Bay in Wasaga Beach because of the bacteria. Hoar said he doesn't understand why interest in the deaths dissipated so quickly. He said he doesn't think people understand how serious a threat botulism is, especially for loons. 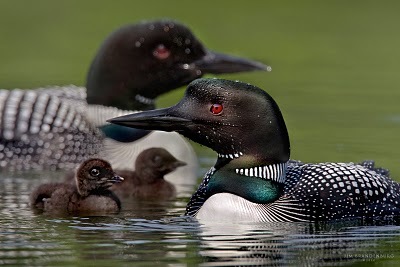 Hoar said loons are at risk in general because they are a sensitive species, affected greatly by water quality and specifically metal content. Also, he said the location of their nests in low-lying shoreline areas puts their eggs at risk. "A boat wake can easily swamp a nest and end them," he said. According to Hoar, the way to combat botulism is by stopping the problem at its root. He said reducing algal blooms should be a key priority and the time to act is now. "If we wait any longer, it will be too late," he said. Hoar suggests changing the conditions of our lakes in small ways, such as cutting back on fertilizers, which add phosphorus to the water, a necessary ingredient to produce algal blooms. He also recommended boaters empty the water from their bilges each time they enter a new lake to cut down on the spread of invasive species. Hoar said the Great Lakes should serve as a cautionary tale for other area lakes. "Lake Simcoe is a ticking time bomb," he said. "All of the components are there. It just needs the botulism bacteria to get in and start the whole thing."